In this Catalan name, the paternal family name is Catalàand the maternal family name is Pallejà. Neus Català i Pallejà (6 October 1915 – 13 April 2019)  was a member of the Unified Socialist Party of Catalonia (Catalan: Partit Socialista Unificat de Catalunya, PSUC) during the Spanish Civil War and was the only Catalan survivor of the concentration camp of Ravensbrück. The Unified Socialist Party of Catalonia was a communist political party active in Catalonia between 1936 and 1997. It was the Catalan referent of the Communist Party of Spain and the only party not from a sovereign state to be a full member of the Third International. Els Guiamets is a municipality in the comarca of the Priorat in Catalonia, Spain. It is situated in the south of the comarca. A local road links the village to the N-420 road between Falset and Móra la Nova. The Guiamets reservoir is on an affluent of the Siurana (Tarragona). Tarragona, is a province of the southern part of Catalonia. It is bordered by the provinces of Castelló, Terol, Saragossa, Lleida and Barcelona and by the Mediterranean Sea. Premià de Dalt is a municipality in the comarca of the Maresme in Catalonia, Spain. It has a population of 9,788. The Pavelló de la República Library joined what is now the UB's Learning and Research Resources Centre (CRAI) in 1996. It has since grown to become one of the world's leading archival libraries on subjects such as the Second Spanish Republic, the Spanish Civil War, exile, Francoist Spain and Spain's transition to democracy. In addition, the library has important materials on the Soviet Bloc and on the international political history of the twentieth history, particularly the World War II. The Cross of Saint George is a state decoration of the Russian Federation. It was initially established by Imperial Russia where it was officially known as the Decoration of the Military Order of Saint George between 1807 and 1913. The Cross of Saint George was reinstated into the Russian awards system in 1992. United and Alternative Left is a political party in Catalonia, Spain. EUiA has 4000 members and it is the Catalan correspondent of the Spain-wide United Left (IU). Francesc Macià i Llussà was the 122nd President of Catalonia and formerly an officer in the Spanish Army. Lluís Companys i Jover was a Catalan politician. He was the President of Catalonia (Spain), from 1934 and during the Spanish Civil War. The Republican Left of Catalonia is a Catalan pro-independence and social democratic political party in the Spanish autonomous community of Catalonia. It is also the main sponsor of the independence movement from France and Spain in the territories known as Catalan Countries. Occitan Republican Left, formed in 2008, acts as the Aranese section of the party. The Party of Labour of Catalonia was a communist party in Catalonia, Spain. PTC was formed in 1979 following a split from the Party of Labour of Spain (PTE). The leader of PTC was Joan Sánchez Carreté. Eugenio Fernández Granell was an artist often described as the last Spanish Surrealist painter. Estat Català is a pro-independence nationalist historical political party of Catalonia (Spain). Jordi Arquer was a Spanish communist politician and writer from Catalonia. The Catalan donkey is a breed of large domestic donkey from Catalonia, in north-eastern Spain and south-western France. Approximately 80% of the population is in Catalonia, and approximately 20% is in the historic Roussillon region of France. The "Catalan of the Year" award is organized by El Periódico de Catalunya, which since 2000 recognizes the Catalan person that was the most prominent in the development of their social or professional activity during the previous year. The award is voted by readers of the newspaper, after a previous selection of different nominees by am jury composed of persons from different social environments. Francesca Bonnemaison i Farriols was a Spanish Catalan educator and promoter of female education in Catalonia. She established Biblioteca Popular de la Dona, first library exclusively for women in Europe, in Barcelona in 1909. 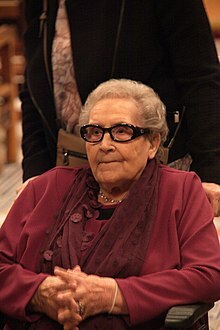 Carme Monturiol i Puig was a Catalan writer, translator, storyteller, poet, and playwright. Núria de Gispert i Català is a Spanish politician and lawyer. Between 2010 and 2015 she served as speaker of Parliament of Catalonia. Bonaventura Gassol i Rovira, known as Ventura Gassol, was a Catalan poet, playwright and politician. A nationalist, he was prominent member of the Esquerra Republicana de Catalunya. Jordi Guixé i Coromines is a historian, founder director of the European Observatory on Memories (EUROM) of the University of Barcelona Solidarity's Foundation and an associate professor. With a Ph.D. in Contemporary History from both the University of Barcelona and the University of Paris III, he is currently a member of several research groups, such as the Institut des Sciences Politique du Socials of the Centre National de la Recherche Scientifique (CNRS), Centre d'Estudis de les Èpoques Franquista i Democràtica of the Universitat Autónoma de Barcelona (CEFID-UAB), the Group of Research on Memory and Society at the Universitat de Barcelona and the Centre de Recherche sur les Sociétés et Environments en Méditerranée (CRESEM) of the Université de Perpignan Via Domitia (UPVD). In 2016 he was elected vicechair of the Board of the International Committee of Memorial Museums in Remembrance of the Victims of Public Crimes (IC-MEMO), one of the 31 committees of the International Council of Museums (ICOM). From 2007 to 2010, J. Guixé participated in the creation of the Memorial Democràtic de Catalunya and was responsible of the heritage area as well as international relations. Among other projects, he coordinated the Census of Francoist Symbols in Catalonia. Maria Verger Ventayol (1892–1983) was a Spanish archivist, librarian, and poet in Catalan and Spanish. Joan Solà Cortassa was a Catalan linguist and philologist. He was professor of Catalan language and literature at the University of Barcelona from 1984 onwards, and vice president of the Institut d'Estudis Catalans (IEC) from 2009. 1 2 3 Women War & Peace: Women's Stories of WWII from Ireland, Spain, Germany, and Poland. Instituto de Formación y Estudios Sociales. Smashing Times Theatre Company. November 2016. ISBN 978-0-9957376-0-0 . Retrieved 15 April 2019– via Epageflip.net. 1 2 Creus, Jordi (2007). Dones contra Franco. Barcelona: Ara Llibres. ↑ ACN, Falset (14 June 2015). ↑ República, Universitat de Barcelona CRAI Biblioteca del Pavelló de la (2006). "Inventari del Fons FP, Subsèrie Neus Català, del CRAI Biblioteca del Pavelló de la República de la Universitat de Barcelona". ↑ Colell, Elisenda (13 Apr 2019). "Muere a los 103 años Neus Català, superviviente de los campos de exterminio nazi". elperiodico. Retrieved 14 April 2019. ↑ Catalunya dedica el 2015 a Neus Català, l'ùltima supervivent de Ravensbrück. Català, Neus (2005). De la resistencia y la deportación: 50 testimonios de mujeres españolas[Of resistance and deportation: 50 testimonies of Spanish women]. Barcelona: Memorial Democràtic. OCLC 936144680. Belenguer Mercadé, Elisenda (2006). Neus Català: memòria i lluita. Barcelona: Debarris. ISBN 978-84-935342-0-2. OCLC 803461366.